She is crying in the darkest corner of the park when a gentle hand lightly touches her sunflower colored tattooed shoulder. "What's troubling you child?" Came a soft voice. "I'm afraid." Deep anguish in her voice. "What are you afraid of?" Comforting voice, soothing her. "I will lose vibrant colors in my paintings. 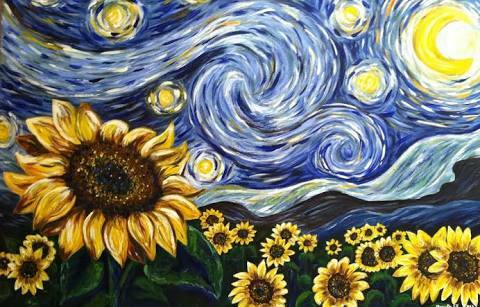 I will never be like Van Gogh anymore." Crying pitifully, declaring her fears. "Child, colors can't only be seen in rainbows. Even in this darkest corner lies a beautiful black and that's all the colors of the rainbow combined as one," he said.